The machine gun, which so came to dominate and even to personify the battlefields of World War One, was a fairly primitive device when general war began in August 1914. Machine guns of all armies were largely of the heavy variety and decidedly ill-suited to portability for use by rapidly advancing infantry troops. Each weighed somewhere in the 30kg-60kg range - often without their mountings, carriages and supplies. 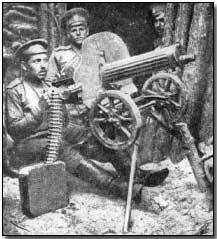 The 1914 machine gun, usually positioned on a flat tripod, would require a gun crew of four to six operators. In theory they could fire 400-600 small-calibre rounds per minute, a figure that was to more than double by the war's end, with rounds fed via a fabric belt or a metal strip. The reality however was that these early machine guns would rapidly overheat and become inoperative without the aid of cooling mechanisms; they were consequently fired in short rather than sustained bursts. Cooling generally took one of two forms: water cooled and, increasingly as the war developed, air cooled. Water jackets would provided for the former (which held around one gallon of liquid) and air vents would be built into the machine gun for the latter. Water cooled machine guns would still overheat relatively quickly (sometimes within two minutes), with the consequence that large supplies of water would need to be on hand in the heat of a battle - and, when these ran out, it was not unknown for a machine gun crew to solve the problem by urinating into the jacket. Whether air or water cooled, machine guns still jammed frequently, especially in hot conditions or when used by inexperienced operators. Consequently machine guns would often be grouped together to maintain a constant defensive position. Estimates of their equivalent, accurate, rifle firepower varied, with some estimating a single machine gun to be worth as many as 60-100 rifles: a more consensual figure is around 80, still an impressively high figure. High enough indeed to make the British army's dismissal of the potential worth of the device in the early 1900s all the more difficult to understand. Hiram Maxim, who designed the machine gun which bore his name in 1884, first offered use of the machine to Britain. Although rapid-firing weapons, such as the 0.50-inch calibre Gatling Gun (invented in 1862), existed many years prior to Maxim's invention, all required some form of manual intervention, e.g. hand cranking. Unfortunately for Maxim the British army high command could see no real use for the oil-cooled machine gun he demonstrated to them in 1885; other officers even regarded the weapon as an improper form of warfare. Not so the German army which quickly produced a version of Maxim's invention (the Maschinengewehr 08) in large quantities at a Spandau arsenal; by the time war broke out in August 1914 the Germans had 12,000 at their disposal, a number which eventually ballooned to 100,000. In contrast the British and French had access to a mere few hundred equivalents when war began. In designing his machine gun, Hiram Maxim utilised a simple concept. The gas produced by the explosion of powder in each machine gun cartridge created a recoil which served to continuously operate the machine gun mechanism. No external power was needed. His initial design, which was water cooled and belt fed, allowed for a theoretical rate of fire of up to 600 rounds per minute (half that number in practice). It was heavy however, weighing in at 62kg. As already noted the Germans quickly grasped the potential importance of machine guns on the battlefield. From the outset the German army demonstrated the value of the machine gun by creating separate machine gun companies to support infantry battalions. The British however did not create their Machine Gun Corps until October 1915; until this time the few machine guns available were attached in sections to individual battalions. A mere two guns were allocated to each infantry battalion in 1914. When established in fixed strong-points sited specifically to cover potential enemy attack routes, the machine gun proved a fearsome defensive weapon. Enemy infantry assaults upon such positions invariably proved highly costly. The French in particular found to their cost that the technology of defensive warfare was more advanced than that of offensive warfare. The French pre-war military blueprint, Plan XVII, was founded upon a fundamental assumption of an 'offensive spirit', one which envisaged a rapid war of movement. Early commanders, such as Charles Lanrezac, were dismissed for apparent failures in their implementation of the offensive spirit. Time was to vindicate Lanrezac's doubts. The British similarly found to their repeated cost the futility of massed infantry attacks against well-entrenched defensive positions protected by machine gun cover. The first day of the Somme Offensive amply illustrated this, although the lesson appeared to be lost to the British high command. On the opening day of the offensive the British suffered a record number of single day casualties, 60,000, the great majority lost under withering machine gun fire. Understandably most historical accounts of the First World War have tended to emphasise the defensive strengths of the machine gun. Throughout the war efforts were made to produce an infantry assault version, such as the Lewis Light Machine Gun, although these efforts were generally unsatisfactory. Although lighter at around 12kg they were still considered too heavy and bulky for rapidly advancing infantry. Attempts to transport light machine guns by wheeled carriages or pack animals were ultimately unsuccessful: the infantry invariably outpaced such methods. By 1918 however one-man portable machine guns (including the formidable Bergmann MP18 submachine gun) were put to some use (each weighing 9-14kg), although maintaining sufficient ammunition supplies remained a difficulty. Although often not truly portable light machine guns were more readily transported on roads or flat ground by armoured cars. As the war developed machine guns were adapted for use on tanks on broken ground, particularly on the Western Front (where the majority of machine guns were deployed). Light machine guns were adopted too for incorporation into aircraft from 1915 onwards, for example the Vickers, particularly with the German adoption of interrupter equipment, which enabled the pilot to fire the gun through the aircraft's propeller blades. In response to the increasing success of machine guns mounted on aircraft it was perhaps inevitable that machine guns should similarly be developed as anti-aircraft devices (in France and Italy), sometimes mounted on vehicles. Similarly machine guns began to be added to warships as a useful addition to naval armaments. Browning Automatic Rifle (BAR) U.S.